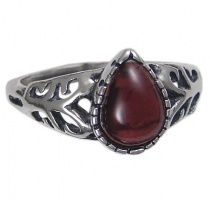 Available only as shown, with Garnet Stone. Shown in Garnet with Onyx accent Stones. Choose stone and ring size. Stone Size: Center - 8mm x 10mm. Shown with Onyx Center Stone and Amethyst Accents. 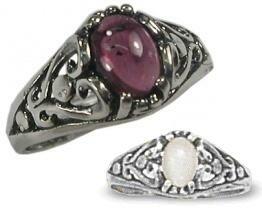 Shown with Amethyst Center Stone and Garnet accent Stones.